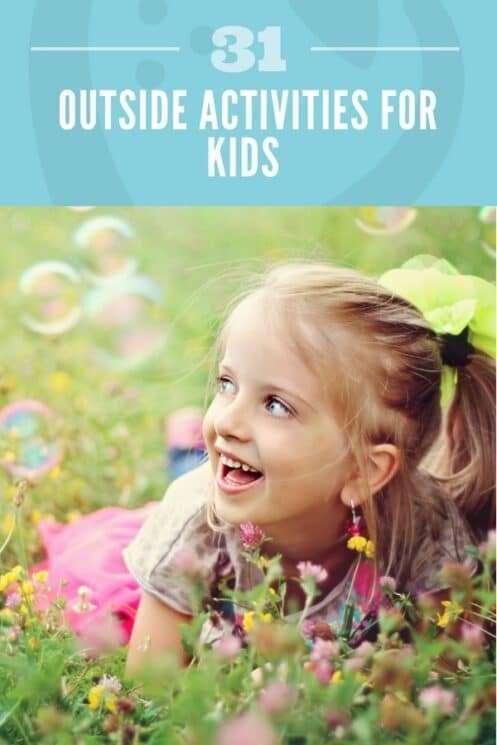 There are so many fun and creative ways to help your kids get outside and we have 31 really fun outside activities for kids! Encouraging kids to get outside and play is usually a lot easier when the weather is nice. But even then, kids may need a little creativity to make playing outside a regular habit. There are also challenges now that as adults we didn’t have growing up. Many kids today have replaced outdoor play with sedentary activities like computer-based games, texting or social media. They are also involved in knowledge-based downtime such as homework and studying more than past generations. The more outdoor activities you can encourage and facilitate for your kids, the more it will become a part of their life and habits. Creating outdoor experiences for the entire family is a big part creating an outdoor lifestyle. Somehow as parents, we need to make being outdoors a natural part of our children’s everyday lives, even if its only for a few minutes. There are so many fun and creative ways to help your kids get outside and we have 31 of them for you! Organize an outdoor playdate. It is always more fun when your kids have friends to play with and they are most likely to want to stay outside longer. Let your kids plant a mini-garden. If they are in charge of it, then they will have to go outside to water, weed and watch over it. Help your kids built a fort outside with a rope and an old sheet. Suggest other items that might be fun for them to use on their fort. Go for regular walks, bike rides or runs as a family. Many urban communities have trails and bike paths through parks, riverways or lakefronts. Have a picnic lunch at the playground or park. Create an outdoor scavenger hunt where your kids collect items from nature. Try geocaching. If you have never heard of it, geocaching is a real outdoor treasure hunting game using GPS-enabled devices. You navigate to a specific set of GPS coordinates and then attempt to find the geocache hidden at that location. This is a great guide to get you started. Make a bucket list of different parks you want to try and visit. Give your kids a container and have them collect different kinds of bugs. Turn your yard into an obstacle course – use cones, a hula hoop and other things that can create obstacles. Blow gigantic bubbles. Fill up a sheet pan with a bubble mixture and dip an oversized wand to see who can blow the biggest bubble. Play with water. Kids will run at the chance to go outside and splash in water. There are lots of creative ways – wash the car, water the garden, run through sprinklers, slip-n-slide, a blow up pool, or build a water table. Try a new sport. Sometimes a friendly game of dodge ball, whiffle ball, or soccer is a great way to get kids to enjoy playing outside. Sidewalk Art. Give your kids a big bucket of sidewalk chalk and let them go to town. Give them some ideas with printed photos, or even stencils to color with. Take your kids ‘bouldering’. Kids love to climb on things – take them somewhere that has rocks available to climb. Eat dinner on your porch, deck or in your backyard. Make a boat to float down a stream. Your kids will be eager to test it out, but you will probably have to go on a hike to get to a stream! Use an outdoor toy rotation strategy. Kids are lot more excited to play with toys they haven’t seen in a while or can’t access. Divide your outdoor toys into 3, and have one big bucket of toys out at a time. This might include bubbles, balls, kites, jump ropes, skateboards, sports equipment, and water guns. Make an outdoor activity jar. This helps with kids who have a hard time thinking of things to do, or making decisions. Write different activities on popsicle sticks. Let your kids choose an activity and then head outside. 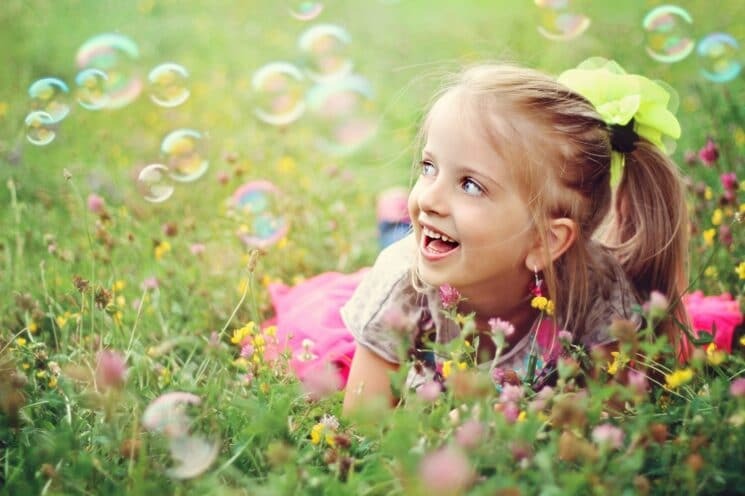 Make the activities easy to act on – go to the park for 15 minutes, water the plants, set up a water shooting gun range, pick a dandelion bouquet, draw something with sidewalk chalk. There are so many fun ideas! Do your normal everyday activities outside. Do homework, eat meals, craft, read books, or play games all outside! Even if you don’t have a formal outdoor living space, find some shade and throw down a blanket! Outside art projects. If you are tired of your kids projects making a mess in your house, then bring them outside! A few fun ideas are: a playdough picnic, let your kids make pretend food out of clay or playdough. Nature art – collect leaves, flower, sticks, seeds, and pine cones to make natural artwork. Outdoor painting – bring an easel and paint out to your backyard so your kids can enjoy painting nature scenes. Star gaze. Set up a blanket, binoculars or a telescope and enjoy the sky! Have a bonfire. Make sure you practice good fire safety habits and supervise all campfire activities. But this is a great way to bond with your family, create memories and enjoy the outdoors. Clean up Litter. Kids may not think this sounds fun at first, but you can make it a game. A mission to save the planet! Find a race to participate in. Push a jogging stroller if needed for younger kids and run together as a family. Ride scooters, bikes or tricycles. Set up a mini race and compete on wheels. Find a local ‘pick your own’ and let your kids pick produce straight from the plant. Play Bug or Leaf Bingo. Find 10 different bugs or leaves and identify them. Take your kids outside with a camera and see how many different types of wildlife you can find. Best idea I read this week, why? Kids dont get to be in nature these days, in London where Ive lived all my life and in many cities we are separated from nature and kids dont see the beauty of nature and grow up not appreciating the simplest things in life such as a lovely sky and sunset, playing in the soil with their toys and discovering the real world under that tarmac and concrete that has existed for millions of years. Your ideas are not only great but essential. Love #2 and #15! My kids always talk about “parkour” but do not really know what it is! I need to take them to our local parkour park and then find some boulders! We have mountains nearby! there must be some!